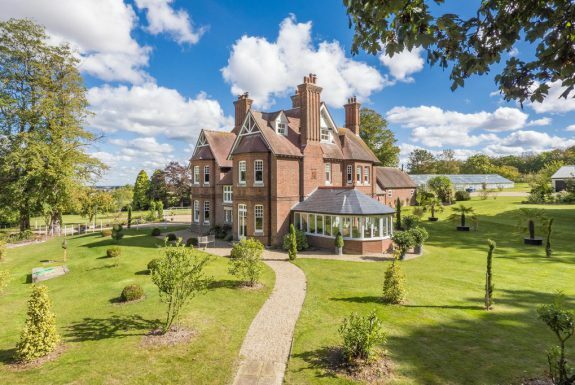 This high specification property enjoys accommodation in the region of 6,540 sq ft, comprising 6 bedrooms (6 en-suite) and open plan reception space, media room, gym and sauna/steam room. Carport with studio/annexe above with total grounds of approximately 5 acres (further land available via separate negotiation). Living accommodation extending to 6,540 sq. ft.
PROPERTY DESCRIPTION Set within 5 acres of private land, this high specification, newly constructed property situated approximately 3 miles from the well-served town of Woodbridge which lies along the River Deben. 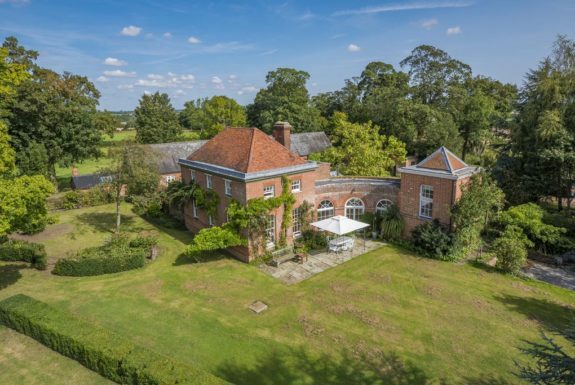 Accessed via a private lane amidst Seckford Golf Centre and adjacent to Seckford Hall, a Tudor mansion believed to date from the 16th century. With accommodation in the region of 6,540 sq ft, this architecturally imposing bespoke residence combines external aesthetic appeal of blended red brickwork, aluminium framed windows, oak panelling, soffits and facia boards, 9ft glass panelled doors and two significant roof terraces. Internal accommodation offers six bedrooms (six en-suite) and ample open plan reception space, media room, basement level gym, sauna/steam room and 37ft open plan kitchen/dining room with a surround of glass. 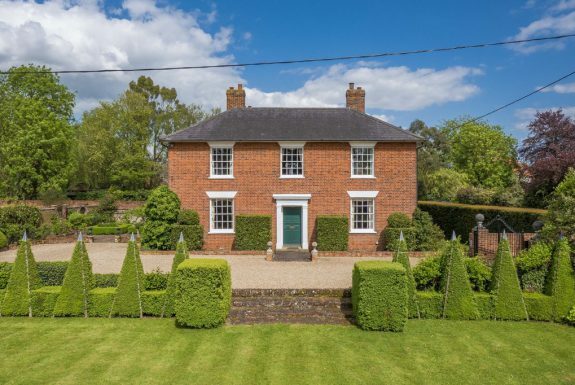 Benefits to the property include a detached triple carport with studio/annexe above, south facing gardens and a substantial terrace with total grounds of approximately 5 acres (further land available via separate negotiations). KITCHEN/DINING ROOM: 37' 5" x 26' 7" (11.41m x 8.12m) An outstanding entertaining area fitted with a matching range of base and wall units with part soft-close, internal oven drawers, granite work surfaces and corner units. Fitted Miele appliances including an oven, grill, microwave oven, wine cooler, fridge and freezer. Further complimented by a 7ft double sided larder style pull-out unit with internal shelving, dishwasher and pull-out pan drawers. A central granite topped island comprises stainless steel single sink unit with mixer tap over, instant hot water tap, induction hob and electric three speed extractor. Natural stone tiled flooring with underfloor heating throughout, glass viewing screen. UTILITY ROOM: 10' 6" x 5' 11" (3.22m x 1.81m) With natural stone tiled flooring throughout, worktops with tiling above and windows to front. Stainless steel single sink unit with mixer tap over and also housing oil-fired boiler. GARDEN ROOM: 20' 9" x 7' 3" (6.35m x 2.21m) With natural stone tiled flooring throughout, 9ft glass to front and side elevation, sliding panel glazed door to outside. BOOT ROOM: 10' 0" x 5' 8" (3.06m x 1.74m) With natural stone tiled flooring, LED spotlights. CLOAKROOM: Fitted with NK Porcelanosa tiling throughout, wall-hung ceramic WC, ceramic wash hand basin set within a floating base level unit with mixer tap over. SAUNA/STEAM ROOM: 21' 0" x 18' 9" (6.42m x 5.72m) Designed to complement the basement level gym as a sauna/steam room. This room provides a potential purchaser with scope to dictate design features. Digital impressions of proposed completion designs are available on request. MEDIA ROOM: 21' 7" x 12' 6" (6.58m x 3.82m) At basement level with no natural light, ideally suited as a media/cinema room with four categories of sensor lighting. GYM: 26' 2" x 11' 4" (7.99m x 3.47m) Natural lighting from obscured glass via the kitchen/dining room, door to store room. EN-SUITE SHOWER ROOM: With sensor lighting and fitted with NK Porcelanosa tiling throughout, wall-hung WC, ceramic wash hand basin within a floating wall level unit and separately screened walk-in shower unit with both wall-mounted and hand-held chrome shower attachments. EN-SUITE SHOWER ROOM: With NK Porcelanosa tiling throughout, wall-hung WC, ceramic wash hand basin within a floating mid-level unit, walk-in shower unit with both hand-held and wall-mounted shower attachments and wall-mounted heated towel rail. LED spotlights throughout and central extraction. 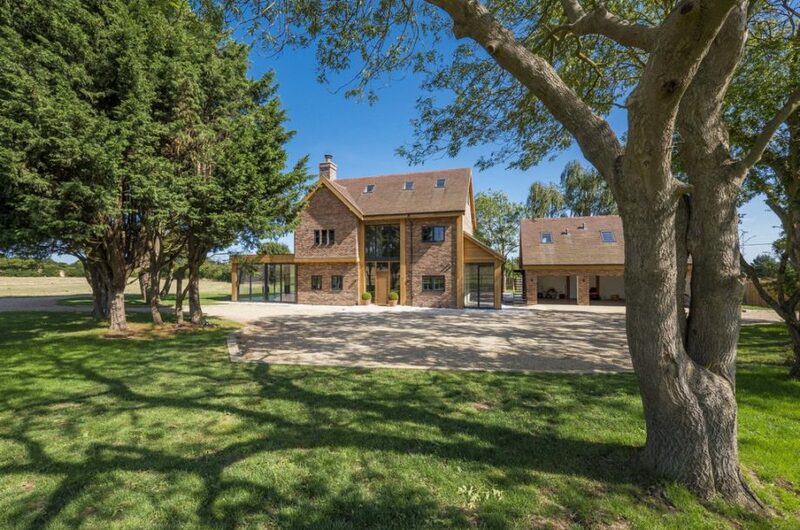 LANDING: With glass viewing screen and open views over surrounding paddock land. EN-SUITE BATHROOM: 14' 9" x 7' 3" (4.51m x 2.22m) Completed to the most exacting of standards with NK Porcelanosa tiling throughout, wall-hung WC, roll-top bath, twin ceramic wash hand basins with waterfall feature and storage below. Windows to front, wall-mounted heated towel rail and walk-in shower with wall-mounted and hand-held chrome shower attachments. EN-SUITE SHOWER ROOM: 9' 10" x 6' 3" (3.02m x 1.91m) With feature tiled walls, NK Porcelanosa tiling and fitted with wall-hung WC, ceramic waterfall wash hand basin with storage below, wall-mounted heated towel rail and walk-in shower unit with both wall-mounted and chrome shower attachment. BEDROOM 3: 25' 4" x 23' 3" (7.73m x 7.10m maximum) An L-shaped room enjoying an elevated setting with varied include roofline, bespoke shaped window affording elevated views over the surrounding paddock land and farmland beyond. EN-SUITE SHOWER ROOM: 7' 7" x 5' 5" (2.33m x 1.66m) Fully tiled and fitted with NK Porcelanosa wall-hung ceramic WC, wash hand basin within a floating storage unit, walk-in shower unit with both wall-mounted and hand-held chrome shower attachments. Extraction over and Velux window to rear. EN-SUITE SHOWER ROOM: 10' 6" x 5' 0" (3.21m x 1.54m) Fully tiled and fitted with NK Porcelanosa wall-hung WC, ceramic wash hand basin within a floating unit, walk-in shower unit with both hand-held and wall-mounted shower attachments. Velux window to rear and window to side. SITTING ROOM/OFFICE: With two Velux windows to front and a further two to rear, range of power points and eaves storage space. CLOAKROOM: With tiled flooring throughout, fitted ceramic WC and wash hand basin with wall-mounted electric radiators. SERVICES: Mains water, drainage (to be confirmed with owner) and electricity are connected. Oil fired heating to radiators. Underfloor heating in several rooms. NOTE: None of these services have been tested by the agent.